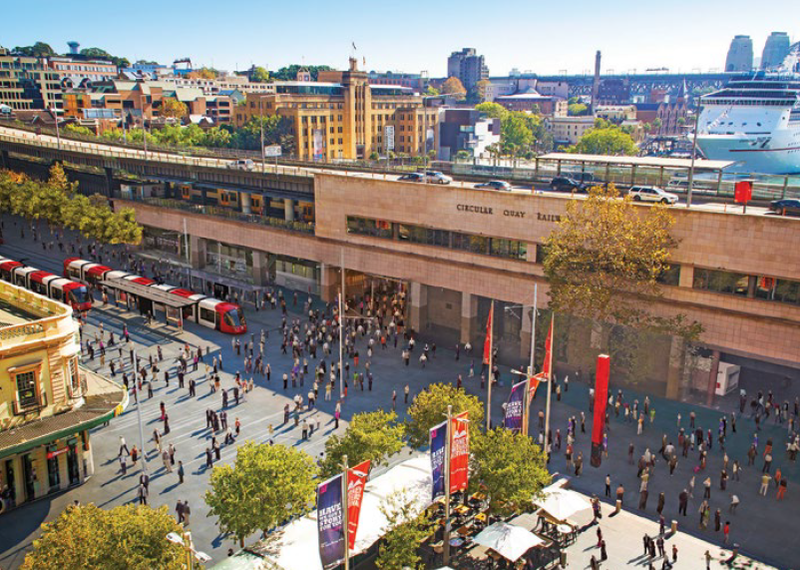 The Committee for Sydney recently tweeted about the importance of dense intersections in creating better quality urban areas. Small blocks with frequent intersections improve pedestrian movement and lead to better experiences, whereas larger blocks with fewer intersections do the opposite. In suburban areas, cul-de-sacs often have the effect of calming traffic on the streets, but with the negative side effect of hindering mobility by foot. It effectively forces individuals into their cars in order to get around. But that is not always the case. Below is a map of Baulkham Hills, the neighbouring suburb to Winston Hills (second from the right in the Committee for Sydney tweet above). The two suburbs are separated by the M2, seen on the right half of the bottom edge of the image below. There are 2 main roads running North-South on either side of the image, with the connecting streets often ending in quiet cul-de-sacs. The 2 main roads, together with the M2, are also where bus routes provide public transport for this area. The focal point is the small park in the centre of the image. It has 3 cul-de-sacs surrounding it, two to the North (above) and one to the East (right). This park has pathways connecting the park to each of these sul-de-sacs, as well as to the other street just to the West (left), which are all accessible by pedestrians but not to cars. Someone in the cul-de-sac to the East would ordinarily be quite isolated. The map below shows the same area, with a red spot showing that particular cul-de-sac and the blue areas shows everywhere accessible within 400m using only streets. This is equivalent to a 5 minute walk and reaches neither of the 2 roads where the buses operate. As can be seen, it does not provide much coverage and it is this sort of urban design that leads many suburban residents to abandon walking or even public transport in favour of their private car to get around. This is where the park comes in to play. By linking up the 4 surrounding streets, it massively enhances the areas accessible within 400m. An additional 3 pedestrian walkways, also shown in green, provide further access. So the actual areas accessible on foot can be seen in green and yellow as well as the initial blue on accessible by streets only. 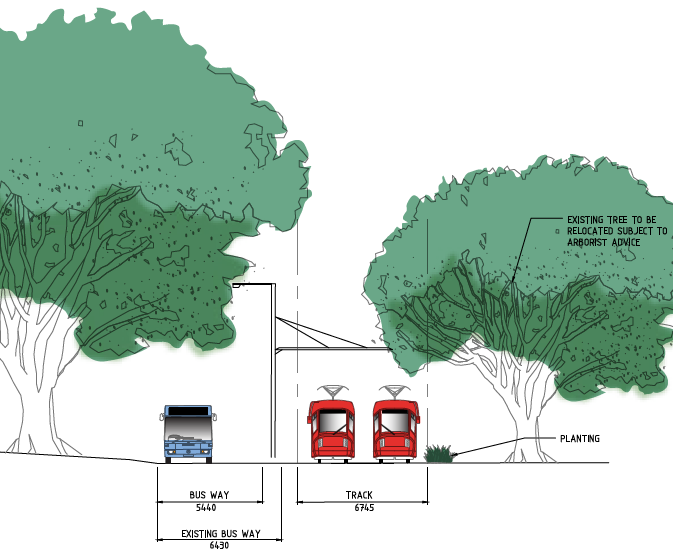 This has the added benefit of extending the areas within 400m to both the roads where buses operate. By providing these pedestrian links, the urban design achieves the dual goals of quiet suburban street with limited traffic as well as easy and convenient pedestrian access to a large catchment. 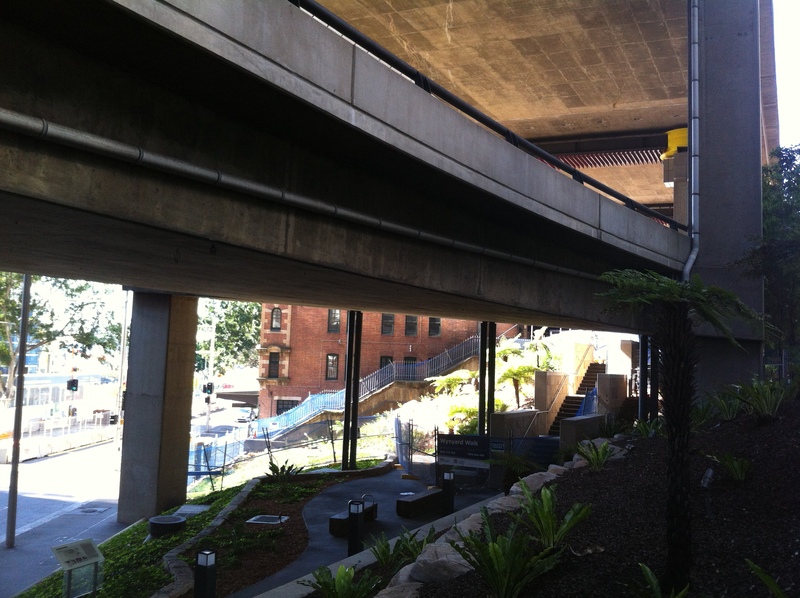 Could this be Sydney’s version of New York’s High Line? 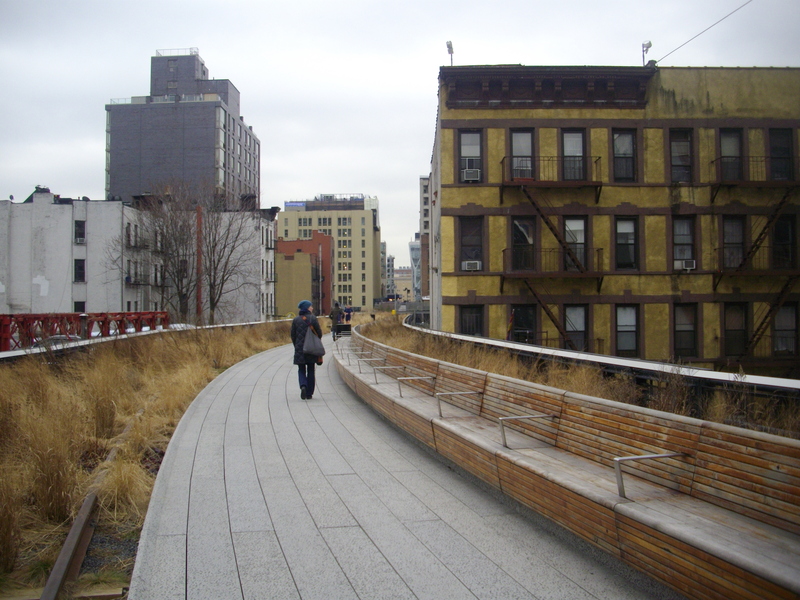 Over a year ago this blog discussed the proposal to turn the old monorail tracks into an elevated walkway, in the context of comparing it to New York’s famous High Line. The argument was made that the former metropolitan goods line, or at least the remaining portion of it between Central Station and the light rail line, was a better comparison. This is being converted into a pedestrian space, providing both a means of travelling around the city on foot as well as being a destination in its own right. 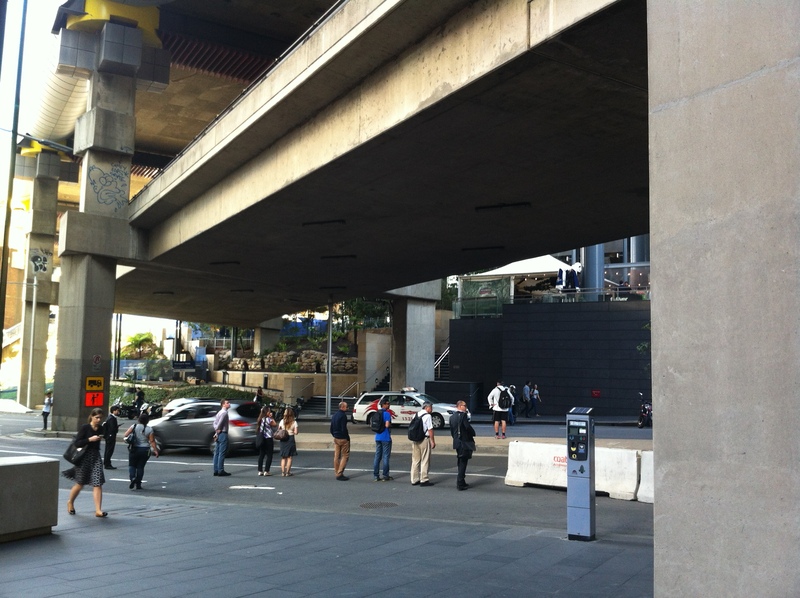 But there is one place in the Sydney CBD that is similar to the High Line: an uncompleted portion of the Western Distributor at the Southern edge of Barangaroo. Much how the High Line in New York was a disused freight line that was later converted into public space, this never completed section of the Western Distributor lays dormant and unused. The story behind it goes back to the 1960s, when the Western Distributor was first being built (documented in great detail at the highly recommended Ozroads website). The Harbour Bridge, whose construction was concluded in the early 1930s and not extended further due to Depression and war, had been extended further East via the Cahill Expressway as part of a post-War expansion of the roads network with plans for a continuous freeway all the way through to the current Syd Enfield Drive at Bondi Junction. The Western Distributor was to be the first part of a freeway linking the Southern end of the Harbour Bridge West to the M4 at Concord and South to St Peters. To this end, it was designed as a two level viaduct. The then Department of Main Roads provided this description: “The top level will consist of a divided six-lane expressway…between the Sydney Harbour Bridge and the Ultimo Interchange…The lower level will be mainly a collector-distributor road with a number of connections to the city streets” (Source: Ozroads). The first stage, from the Harbour Bridge to the Pyrmont Bridge (now fully pedestrianised, but back then still open to vehicle traffic) was completed in 1972. However, by 1977 the government dumped plans for a freeway all the way to Concord and St Peters, making the two level viaduct plan unnecessary. The Western Distributor was therefore only built as, and today remains, a single level viaduct. 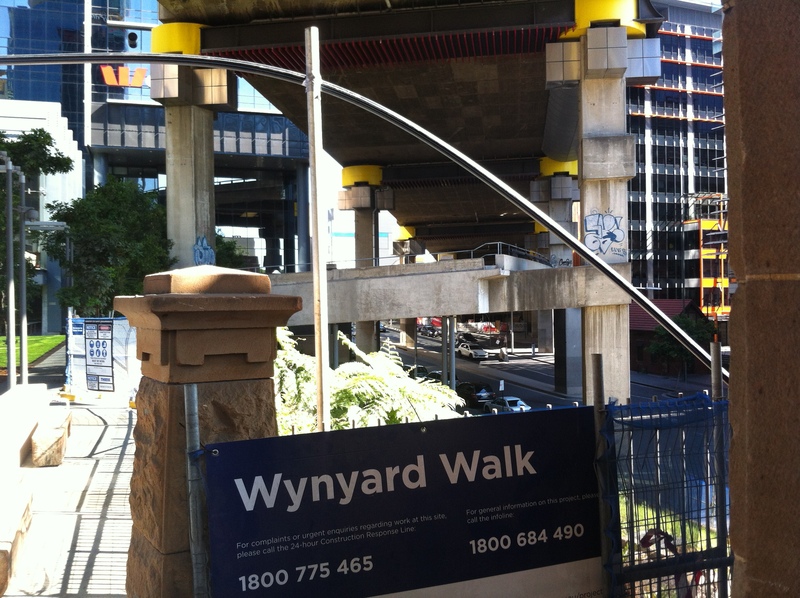 But there is one section of the lower level that was built, at the Southern end of Barangaroo, around where the currently under construction Wynyard Walk (designed to allow pedestrians to travel between Barangaroo and Wynyard Station) comes out from underground at the Barangaroo end. With a bit of work, there is no reason why this cannot be linked up to the Wynyard Walk and converted into public space. It won’t be the size of the New York High Line, not by any means. But given its location, it certainly has the potential to be an iconic piece of the public domain in its own right. Images below are from the author of this blog. Click to enlarge. How might the CBD and SE Light Rail work? The Environmental Impact Study for the CBD and South East Light Rail is due to be completed by the end of this year, finalising the project before construction begins. Enough details have been released about the project that a fairly complete picture can be drawn of what it will look like and how it will operate. Trams will operate along an overhead wire free zone starting from where the pedestrianised zone beings at Bathurst St and continues all the way to Circular Quay. Along this portion of the alignment trams will be powered by onboard batteries which are recharged with overhead wires at each stop. Overseas experience suggests batteries could allow for up to 2km of travel at a time before recharging (Source: George Street Concept Design, 2013, City of Sydney, p. 27). This will also allow limited operation should there be a short term power outage, but will also prevent trams on the Inner West Line from operating on George St (though these trams would still be able to travel to Kingsford and Randwick). This move is supported by the City of Sydney on the basis that “it will ensure that…space is preserved for pedestrians [and respect]…the streetscape of George Street and its heritage buildings”; but opposed by advocacy group Action for Public Transport, commenting that “this system would add unacceptably to initial and running costs, would detract from reliability, and would probably not supply enough power for the air-conditioning”. The trams on the CSELR will also be longer than the Inner West ones, being 45m long compared to the current 30m long trams, which have a capacity of 300 passengers and 200 passengers respectively. These longer trams mean that the 45m CSELR trams will not be able to operate on the Inner West line at all. The net effect is an effective segregation of the two lines, forcing them to operate independently. Tram stops at Central Station (Chalmers St) and Moore Park will be double the regular length, allowing 2 trams to load an unload simultaneously, with turnback sidings allowing shuttle services from Central to the Moore Park sports stadiums to provide a high capacity transport connection for special events like double headers. The Central Station and Circular Quay stops will also have a third platform. Meanwhile, the UNSW stop (probably the busiest stop outside of the CBD and special events) will be on UNSW property itself, preventing the need for students and university staff to cross the road unless they need to reach the smaller Western campus end of UNSW. 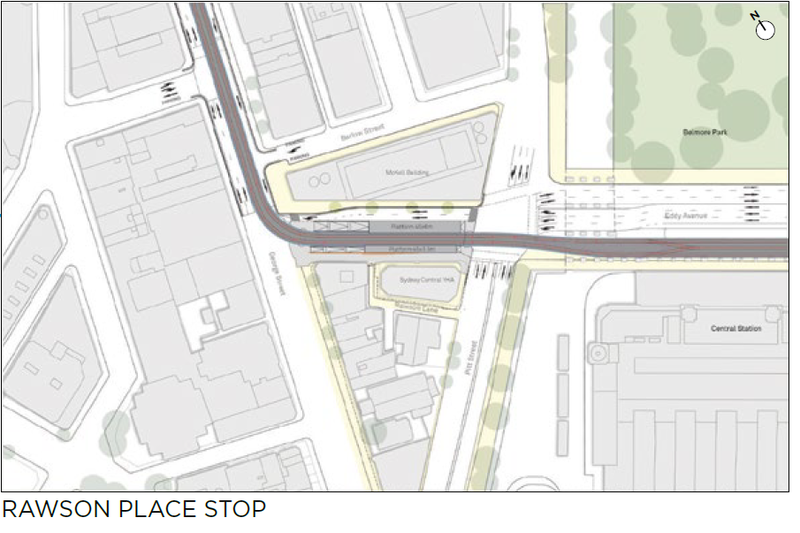 Rawson Place will be closed off to cars and turned into a bus and tram interchange. Buses leaving the CBD will pass through Rawson Place itself, allowing a cross platform transfer, while inbound buses will stop on the Western side of Pitt Street, from which the tram stop will be a short walk away. This avoids the need to cross the road in order to transfer from bus to tram or vice versa. The route across South Dowling Street, Moore Park, and Anzac Parade has yet to be determined, with a cut and cover tunnel or viaduct being the two options. 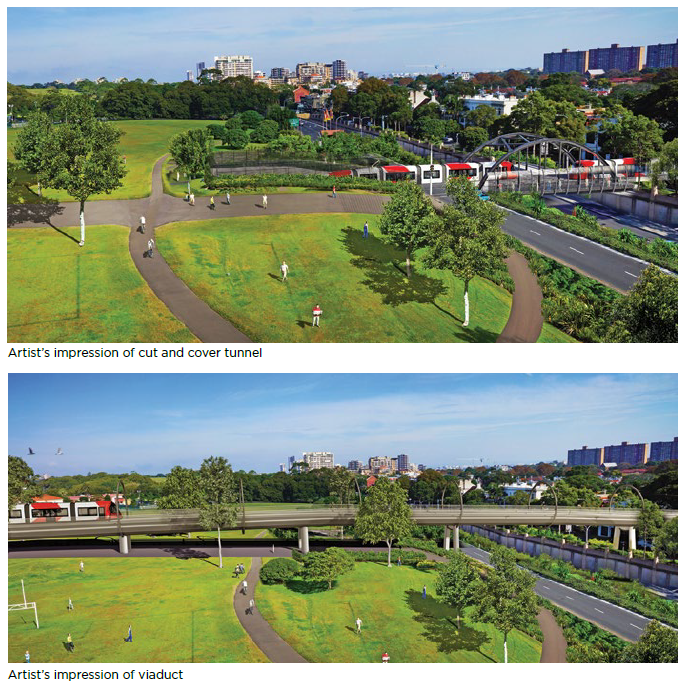 The advantages of a tunnel are the lower visual impact and maintaining full use of Moore Park. The advantages of a viaduct are a shorter construction time and grade separation over South Dowling Street. The government has a preference for the tunnel option, but has also taken feedback from the public on the two options before making a final decision. Upgrading the Anzac Parade corridor will increase the passenger capacity in each direction from the current 10,000 passengers/hour to 15,000 passengers/hour. It does this by replacing some buses (the equivalent of 4,000 passengers/hour with trams that carry 9,000 passengers/hour), which will now not continue past Kingsford and Randwick. They will instead be rerouted as orbital routes that do not reach the city, and instead continue towards destination like Bondi Junction or Green Square. Anyone continuing into the CBD will get off their bus and onto a tram, either by crossing the platform at Kingsford or walking across High Cross Park at Randwick. Some buses will be kept on. In particular, preliminary details of the bus redesign suggest that all peak hour express buses that travel via the Eastern Distributor will be maintained, largely as they service the Northern end of the CBD rather than the Southern end. 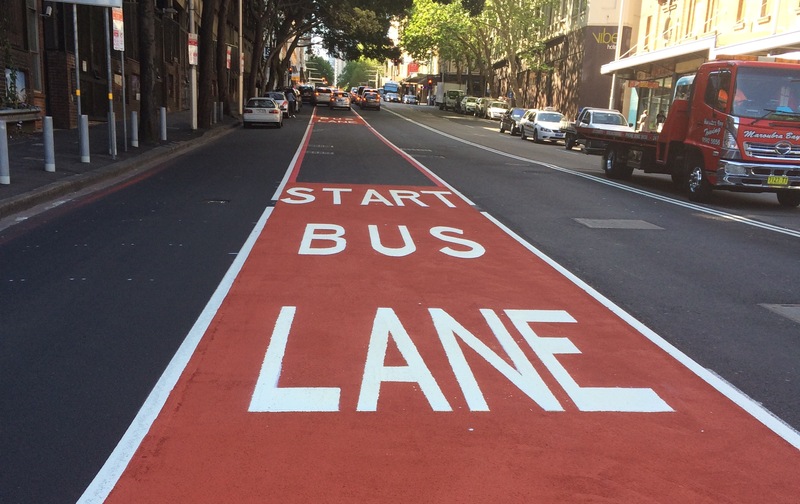 In addition, at least one bus lane will be retained on the existing Anzac Parade busway. Some buses that travel via Cleveland and Oxford Streets will also be retained as these corridors are not served by light rail. Transport Sydney understands that fares for light rail will be calculated as though they are buses, meaning that there should not be a fare penalty for passengers changing from bus to tram or vice versa. This would prevent current bus users from having to pay more once light rail begins operating and many passengers are forced to make a transfer from bus to tram. 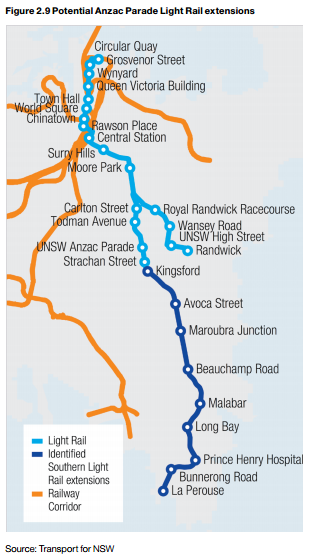 The improvement in transport infrastructure will be followed by higher housing densities, with the NSW Government designating Randwick (and Anzac Parade South, to which the light rail line could easily be extended into) for increased dwelling construction, including 30,000 new dwellings for Kingsford. This issue was prominent enough for the newly elected local MP to campaign about it at the recent September federal election. 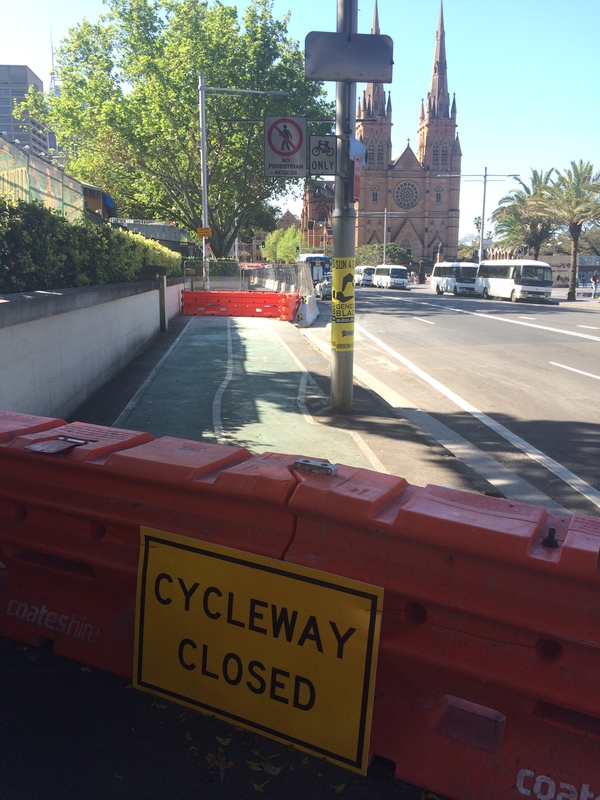 The years of construction are also likely to see significant strain on the existing transport network, with George Street closed down and bus lanes removed long before trams begin operating. With construction set to take 4 to 5 years, it could prove to be a protracted period of pain. The government is set to announce a revised bus network for this construction period by the end of the year, around the same time it released the Environmental Impact Study. It then has until the end of the decade to come up with a second bus network redesign for when the light rail finally comes online. Public transport works best in moving large volumes of people to or from a single destination in a short period of time, while private motor vehicles work best in moving people to and from dispersed destinations over a long period of time. Each performs poorly at the other function, which is why public transport has a high mode share for peak hour commutes into dense activity centres and cars have a high mode share for off peak trips that start and end in the outer suburbs. However, this poses a problem when a major arterial road happens to pass through a major centre, resulting in a high proportion of through traffic. This is the worst of both worlds – lots of cars in a dense centre which have an origin and destination that are not well served by public transport. That is where ring roads come in – they allow these roads to bypass these major centres, while car users still reach their destination. This maintains transport to and within the centre focused on public and active transport (walking and cycling). The most basic ring road is a bypass. Bondi Junction’s Oxford Street used to be its major thoroughfare, resulting in large amounts of traffic passing through it. The construction of the Sydney Enfield Drive re-routed traffic away from Oxford Street, and even allowed the mall to be pedestrianised and limited to buses in certain parts. 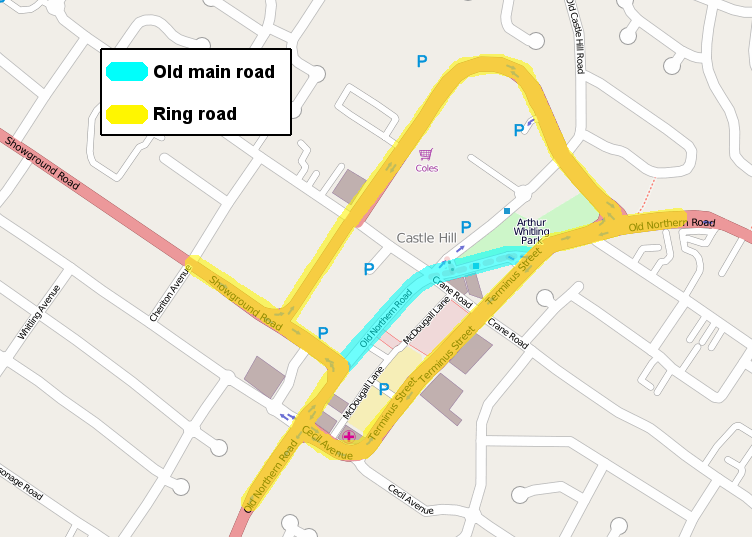 A true ring road actually circles around a major centre, such as in Castle Hill. Here the 3 major roads approach Castle Hill and originally converged onto Old Northern Road. A ring road was then set up to circle the Castle Hill Town Centre, with Old Northern Road’s speed limit dropped and more street space designated for pedestrians, on street parking and a bus road. This allowed cafes and restaurants to set up on the street and created a more relaxed environment, compared to the noisy car dominated road that it used to be. 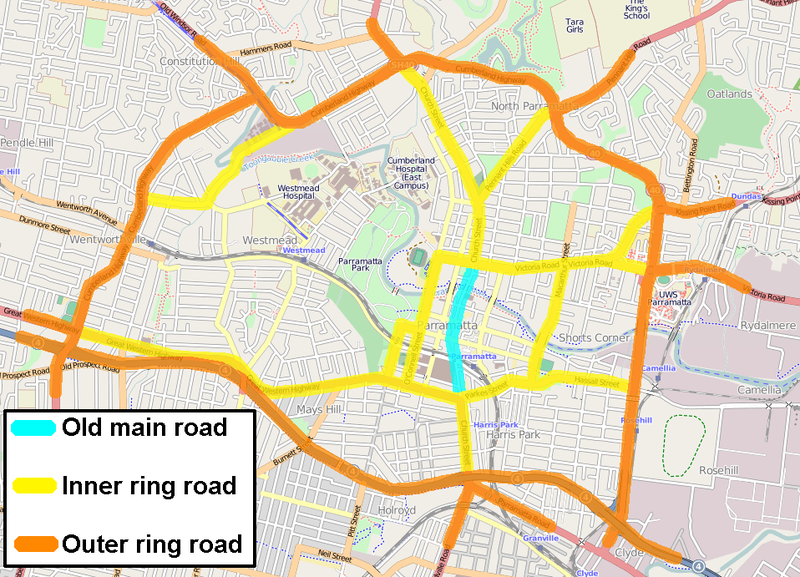 In the case of Parramatta, it’s ring road is now considered too small, and the local council has designated an outer ring road. The inner ring road allowed Church Street (Parramatta’s main North-South high street) to be partly pedestrianised and to become a vibrant cafe, restaurant, and shopping precinct. 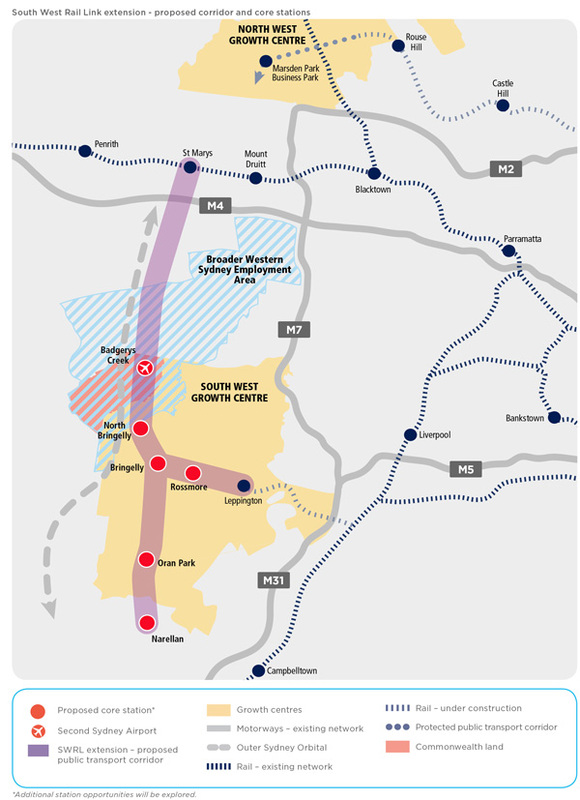 However, the recent growth in the Parramatta CBD means that this ring road is now too small, and thus resulted in an outer ring road made up of the M4 in the South, the Cumberland Highway in the West, and James Ruse Drive in the North and East. This outer ring road is designed with higher speed limits of around 80km/hour, compared to the 60km/hour in the inner ring road, and thus draws traffic away from even the inner ring road. 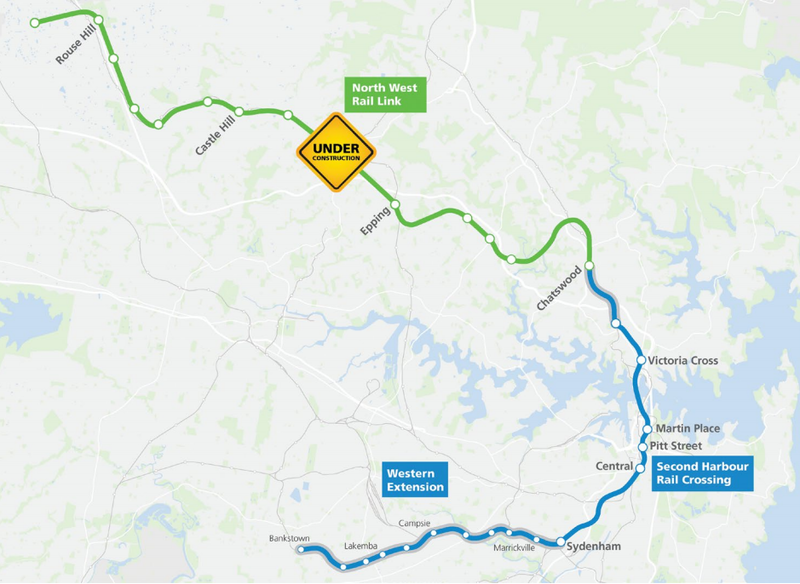 The local council is seeking to make improvements to the outer ring road in key pinch points, and its proposal has obtained support from Infrastructure NSW. 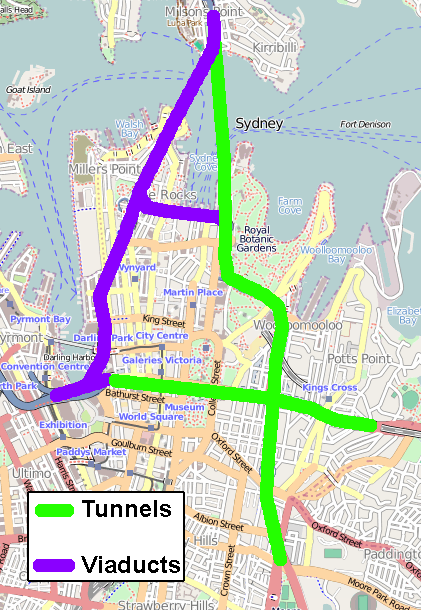 A ring road does not even have to go around a centre, and in the case of the Sydney CBD the Cross City Tunnel and Eastern Distributor, which go underneath the city, are also a type of ring road. Together with the Western Distributor, Cahill Expressway, Harbour Bridge, and Harbour Tunnel, these effectively form a ring road, allowing car drivers to go to or from North Sydney, Pyrmont, Kings Cross, or Moore Park without entering a surface street in the CBD. However, what sets this ring road apart from the other example above is that this is the only case where drivers pay a financial cost for using the ring road, but nothing for going through the CBD. 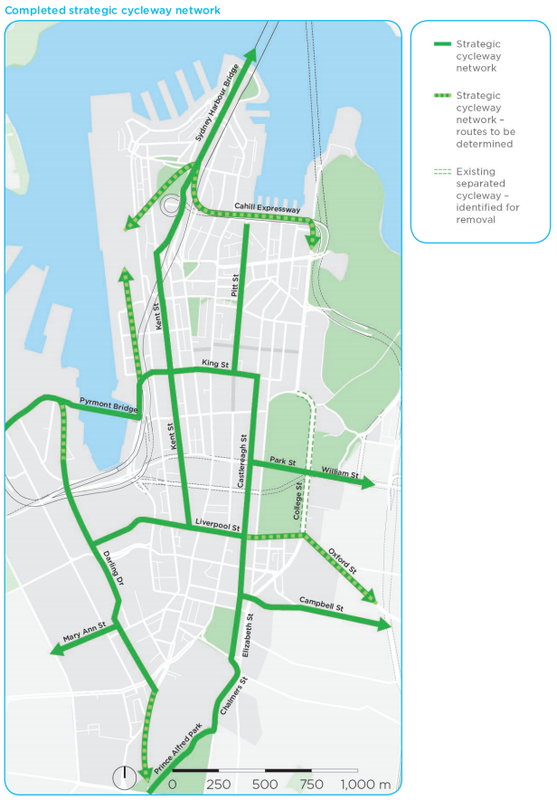 In an ideal world, this situation would be reversed, with access to all parts of these ring roads being free (perhaps with the exception of the Harbour crossings, which cannot be avoided by driving through the CBD) while charging drivers who go through the CBD surface a congestion charge. The new charge could even be used to compensate the private operators of the Cross City Tunnel and Eastern Distributor. There is actually one more road even better than a ring road – a public and active transport only road. An example of this is the proposed Wentworth Point Bridge that will link Sydney Olympic Park to Rhodes Business Park, but which will only be accessible to buses, bicycles, and pedestrians. Cars will continue to have to make their way the long way around, which has a similar result to a ring road, as it prevents cars from passing through both Sydney Olympic Park and Rhodes Business Park.